Can you tell who hasn’t totally figured out the big-girl blankie??? Happy Halloween, all! 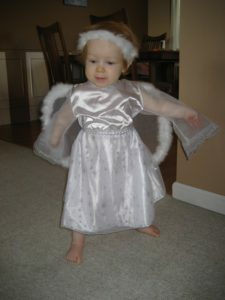 Carter is going as the most unlikely thing ever: an angel! How ironic! Our sweet-but-naughty, adorable-but-always-messy, precious-as-gold Angel Baby!